Where did the week go? This post was supposed to go out on Wednesday and already the week is over! 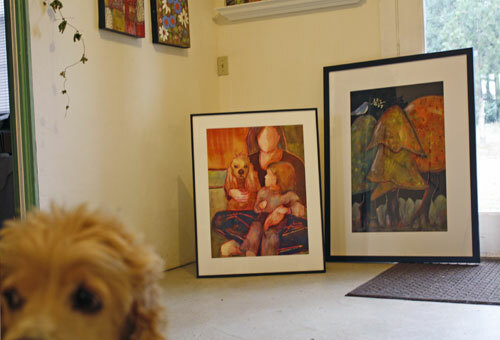 Last week I framed up two paintings for my alma mater, Marylhurst University's Annual Art Exhibition and Sale. The show features art works of Marylhurst alumni artists in a diverse variety of mediums and styles. If you live in the Portland Oregon area with nothing planned for tonight, please stop the opening reception and enjoy the show of over 80 pieces of art (last year's total). The evening includes music, wine and cheese from 6-9PM. Couldn't resist putting this pic of naughty child, Zippy who kept getting in the frame. I was on the floor snapping this shot, he just figured it was play time or or maybe he is trying to draw attention to the fact that he is the subject of the "Beloved" painting! These two paintings will be in the Alumni Show beginning tonight. The other piece is title "Early Bird". (A print is available in my shop. Both paintings are only available at the Alumni Show through the end of November 24. Then after that if they don't sell they can be purchased from my website. After the Open Studio Tour was over I took a good look around at my little gift shop and decided it was time to give it a make over. So on Wednesday I pulled everything out and began repainting the green trim to white, moving in and rearranging different display pieces. I have this love of reusing what I already have in new and better ways. Maybe updating things with a new fresh finish or combining items in unusually surprising ways. So my challenge is to create a new look by reusing, repainting over displays that don't match and building on the pieces I already have. 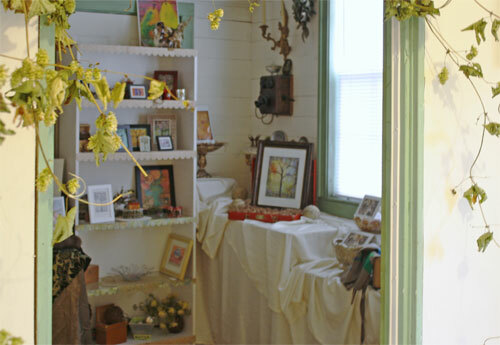 Above is what the gift shop looked like the day after the Open Studio Tour. Things are looking bare and ready for a new look. The green is being painted white. I'm going for a neutral palette of whites, grays, creams, and bits of black. A neutral palette should show off gift items to their best. Have a really great weekend and hope you'll be doing something a little more exciting than repainting trim and old fixtures. Cause that's what I'll be doing! Check back next week, I'm working on an inspiration board for the gift shop makeover.